Forum Index > Off-topic Talk > Another Early Dagger Image? Posted: Mon 02 Nov, 2009 2:48 pm Post subject: Another Early Dagger Image? A while back I posted an image from an 11th century copy of the writings of Hrabanus Maurus which clearly depicted an early form of dagger. 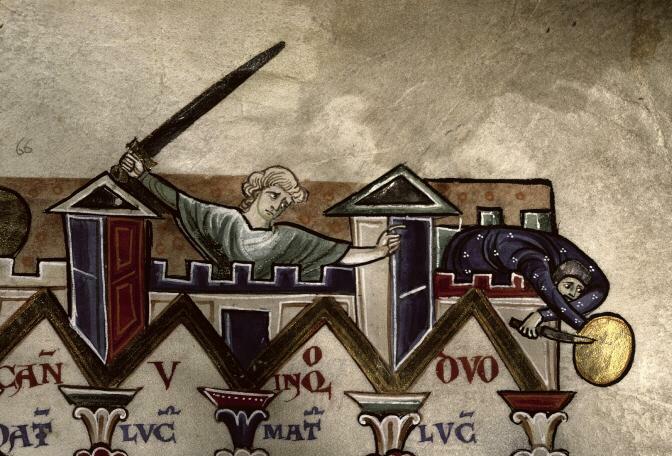 I believe I've found another such illustration, this time dating from the late 12th century. While the weapon in question looks more like a knife, it is clearly being illustrated as a weapon, since the figure in question carries it with a shield or buckler. Saxes and shields have been a popular combination as well. But perhaps this picture is a bit too young to display a sax. Sirs-If I remember correctly, commoner spearmen were often referred to as cousreliers sincce they carried a long knife (coustelle ) instead of a sword. In those times everyone carried a knife, and so it was easy for a commoner to get one. Is not the "coustelle" the same thing as a "coustille"? And if so, was that not a 14th century weapon, rather than late 12th century?